Hello Everyone! Here is an adorable graduation card we made at my Big Shot class last month. This is another way to use the Shine On DSP. 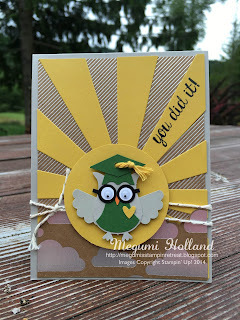 The clouds pattern and the Sunburst die came together in a fun way to show off this multipurpose paper!!! Isn't he so cute??? 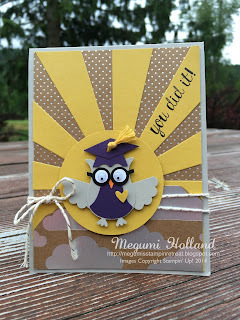 I chose to use purple and gold (yellow) for my owl because they are the school colors for my son's high school. I am happy to say we have survived this busy season having my oldest son graduate from high school. Ever since we came home from the incentive trip to Europe, we had been non-stop! Not to worry - Port Angeles fans!!! I did make this one for you. So you have seen the new catalog and your wish list is a mile long??? Come and learn about the many benefits of being a Stampin' Up! demonstrator. Join in June and you will get to choose TWO FREE stamp sets of your choice, ANY VALUE, to make your Starter Kit even better! Getting started is the best part! All you do is get the Starter Kit. You will choose $125 worth of Stampin' Up! products, and Stampin' Up! will supply you some business supplies and FREE shipping. You will only pay $99! Join us for a fun night of stamping, door prizes, food, friendship and more! If you are ready to sign up, bring a list of your products up to $125 and 2 FREE stamp sets of your choice and I will help you get started right away. Please RSVP so that I can prepare your make and take kit and food. My Big Shot classes are popular so don't wait too long to sign up. Class fee is $5 per person. Please bring your basic tools and adhesive with you. Space is limited. Click HERE to register today! Please join us for a fun time of being creative and getting inspired, make and take projects, new product display, a chance to win one of great door prizes, yummy food, friendship and more!!! Please RSVP so that I can prepare the project kit and food for you. Click HERE to register today! Getting together with my team for some stamping, technique sharing, inspiration sharing, business tips, creating stamping connection and community, and more!